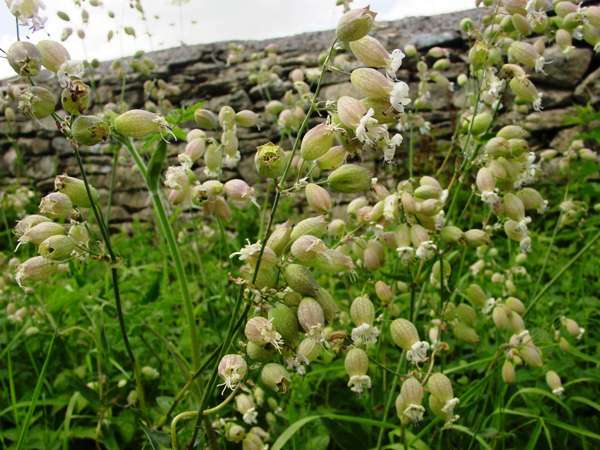 Despite its species name being vulgaris, Bladder Campion is not the most common member of its genus in Britain and Ireland, and there are quite large areas where it is not recorded at all. Up to a metre in height, Silene vulgaris is a much-branching perennial with drooping white flowers and greyish leaves, but it is the large inflated calyx that gives Bladder Campion its common name and makes it so instantly recognisable. Bladder Campion is found throughout Britain and Ireland but it is only common in southern parts. On mainland Europe Silene vulgaris is particularly common in southern countries including Portugal, Spain, France and Italy, and it is also abundant in northern Africa. 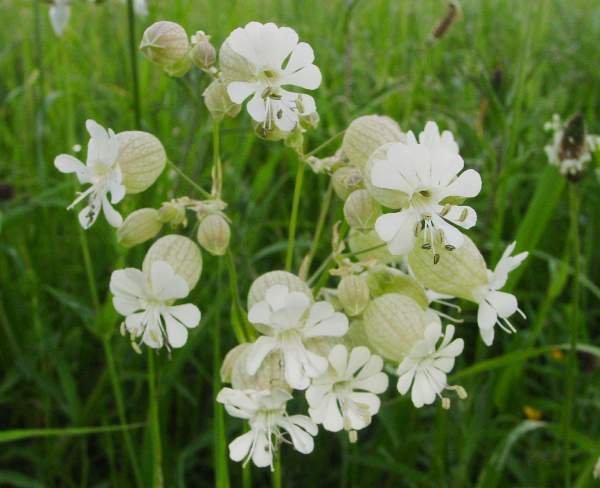 In many other parts of the world Bladder Campion is an introduced species and is now naturalised in the wild. This flower is present in most parts of North America, and in some places it is considered to be a nuisance weed. Unlike White Campion Silene latifolia and Red Campion Silene dioica which favour damp woodland edges and roadside verges, Bladder Campion Silene vulgaris grows in dry, calcareous grassland, often on scrubby field boundaries. In Britain and Ireland the first flowers of Red Campion appear in late May, with the finest displays usually in June and early July, and a few Bladder Campion flowers can usually be seen at least until the end of August. Inevitably the flowers come much earlier in southern Europe, where Bladder Campion can be seen in bloom from late February onwards. By the end of June its flowers are all dead and in all but the shadiest of sites the plants are shriveling up in the heat of high summer. Silene, the genus name, is a reference to the Greek woodland god Silenus the foster father of Bacchus, who was often depicted covered in a sticky foam and whose name in turn comes from the Greek word for saliva. (The female flowers of Red Campion Silene dioica secrete a frothy foam that captures pollen from insects that come to the flowers to gather nectar.) The specific epithet vulgaris means common and is more appropriate to southern Europe than it is in Britain. 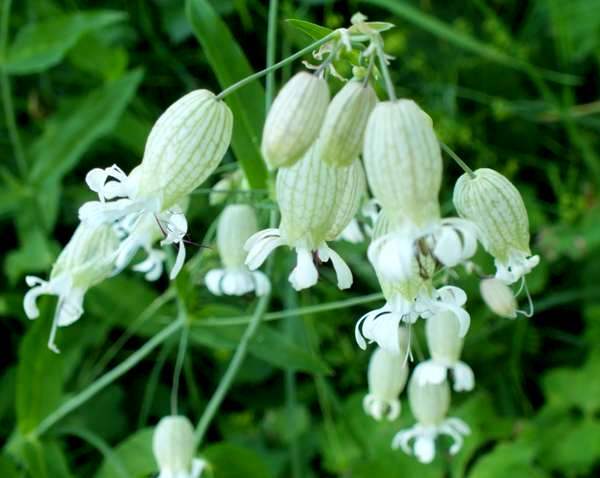 The leaves of Bladder Campion are edible, and they are used in salads and many other dishes in some Mediterranean countries. Plants of the genus Silene have roots that contain the compound saponin, which although a mildly toxic substance has long been used as soap for washing clothes, hair etc. There are references to some kinds of campion being used to treat snake bites and as a cure for corns and warts. Bladder Campion is sometimes mistaken for Sea Campion Silene uniflora, a cushion-forming coastal plant also with greatly enlarged sepal tubes, and less often it is confused with White Campion Silene latifolia, whose flower does not have an inflated calyx. 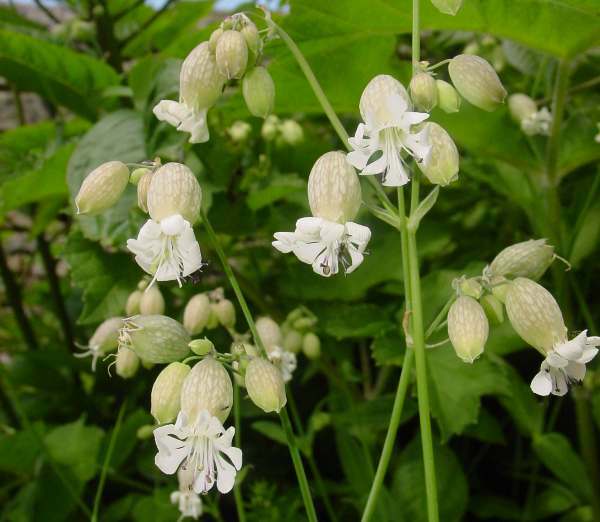 The pictures of Bladder Campion shown on this page were taken in Wiltshire, UK and in northern Italy.